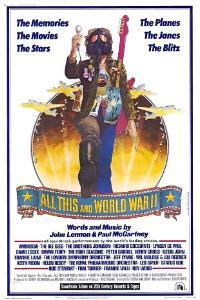 All This and World War II is a 1976 musical documentary directed by Tony Palmer. It juxtaposes Beatles songs covered by a variety of musicians with World War II newsreel footage and 20th Century Fox films. The film was severely mauled by critics and lasted just two weeks in cinemas before being pulled. The film featured clips from the Nazi Germany army newsreels, Edgar Bergen & Charlie McCarthy, Milton Berle, Humphrey Bogart, Richard Burton, Neville Chamberlain, Dwight D. Eisenhower, Clark Gable, Adolf Hitler, Bob Hope, Joseph P. Kennedy, Laurel and Hardy, James Mason, Benito Mussolini, Franklin Delano Roosevelt, Joseph Stalin and James Stewart, among others. The film was directed by Tony Palmer. He has previously released All My Loving, a history of 1960s music in 1968, and the 17-part rock history documentary series All You Need Is Love: The Story of Popular Music. The musical director was Lou Reizner, who also produced the soundtrack album. Although it was rumoured that Terry Gilliam turned down the offer to contribute animation to the documentary, Russ Regan, who conceived of the film, has stated that Gilliam was never asked. Critics savaged the movie with gusto, audiences stayed away, and Fox promptly yanked the film from release. The reviewer in the New York Daily News wrote that the film's PG rating had to have stood for "Positively Ghastly". It appeared out of competition at Cannes in 1977, has occasionally been shown at film festivals, and even on American cable TV. On June 1, 2007 the film played a single midnight show at Landmark's Nuart Theatre in Los Angeles. The film has never been officially released on home video or DVD, but bootleg copies of the film are available from several collector-to-collector resources. A fairly high quality transfer is also available as an unofficial DVD release. A version of this film was released as a DVD plus two CD set by Gonzo Multimedia – TPDVD191 in 2016, entitled The Beatles and World War II, but this is a revised edition by original director Tony Palmer, using different footage and a different soundtrack. The original intention of the filmmakers was to use actual Beatles music in the film. The decision to use other artists covering Beatles music was made by the film's producers after they realised additional money could be made through a soundtrack album. The decision was a sound one, as the soundtrack actually generated more revenue than the film. The album was also released in 1979 with the title The Songs Of John Lennon & Paul McCartney Performed By The World's Greatest Rock Artists, and two of the tracks ("Let It Be" performed by Leo Sayer and "Because" performed by Lynsey de Paul) were released on the Beatles cover version CD album With A Little Help that was released in 1991. The album was finally released on CD in 2006 on the Hip-O Select label and again in 2015 as a limited issue release on the Culture Factory label complete with the original gatefold sleeve. ^ a b Erickson, Hal. "All This and World War II: Overview". MSN Entertainment. Archived from the original on February 23, 2012. Retrieved May 26, 2016. ^ a b c d e f Dannelley, Ronnie (August 2005). "'All This and World War II': Rock's Strangest Film". Rock 'N Roll Case Study. Ear Candy Magazine. Retrieved June 28, 2011. ^ "All This and World War II 1976". The Video Beat. Retrieved June 28, 2011. ^ a b c Hall, Phil (October 1, 2004). "The Bootleg Files: 'All This and World War II'". Film Threat. Retrieved June 28, 2011. ^ a b Marinucci, Steve (July 12, 2016). "Wacky Beatles tribute 'All This and World War II' gets makeover and new title". AXS. Retrieved October 16, 2018. ^ Burridge, Shane (2005). "All This and World War II". Newsgroup: rec.arts.movies.reviews. Retrieved July 17, 2011. ^ Havens, Edward (May 30, 2007). "All This and World War II". FilmJerk. Archived from the original on March 5, 2016. Retrieved March 26, 2016. ^ "War is Hell!". Shocking Videos. Mark Johnston Enterprises and Shocking Videos. Archived from the original on August 21, 2011. Retrieved September 5, 2011. ALL THIS AND WORLD WAR II (76) Finally available! ^ "Top 200 Albums". Billboard. January 1, 1977. Retrieved June 7, 2017. ^ "All This and World War II". Dutchcharts.nl. Retrieved June 21, 2018. ^ "Various – The Songs Of John Lennon & Paul McCartney Performed By The World's Greatest Rock Artists". Discogs. Retrieved April 24, 2018. ^ "Various – With A Little Help". Discogs. Retrieved April 24, 2018. ^ "Various – All This And World War II". Discogs. Retrieved June 21, 2018. ^ "Various – All This And World War II – Original Soundtrack". Discogs. Retrieved June 21, 2018. This page was last edited on 14 April 2019, at 14:20 (UTC).